YOU NEED TO PASS YOUR DMRQA… THE DATE IS RAPIDLY APPROACHING…WANT A LITTLE HELP? You’re in charge of the Membrane Filtration Station for microbiology for the DMRQA test this year. It’s a big responsibility, and demands your fullest attention. Maybe you’re a new technician, or maybe the person who ,”always does it” isn’t around anymore. What if, you don’t pass, and wouldn’t it be great to have another guide? This short informative report will help give you some guidance to assure you’re on the road to success when it comes to testing using membrane filtration. THE 5 “P’S” – LET’S START THERE! “Proper preparation prevents poor performance.” Sometimes with colorful language added…but nevertheless it’s a phrase that is worth repeating! When we talk about being properly prepared in membrane filtration, it begins at the sink. You want to make sure that the filter funnels are nice and clean and free from any debris. They should also be checked periodically for high or low pH walls with a pH indicator solution like bromothymol blue. Make sure all filter funnels, magnetic bases, and manifold are scrupulously clean. FUNNELS, FLUIDS, AND BBQ BACTERIA! After thoroughly cleaning, inspect your polysulfone or glass filter funnel for any deep nicks or scratches. This can harbor bacteria and skew your count or ruin your sterile control. Sterilize the funnel(s) initially in an autoclave, being sure not to touch the inside walls of the funnel when handling. TIP: Beware - The funnels come out of the autoclave HOT! Let them cool, or dispense some sterile dilution water down the interior walls of the funnel prior to filtering the sample so as not to cause any flash thermal exposure (B-B-Q!) to the bacteria, especially if filtering small sample volumes. Be sure to rinse the interior walls of the funnel after sample filtration with sterile, and properly buffered dilution water. Typically it will be slightly basic. Different bacteria require specific temperatures for optimum growth. 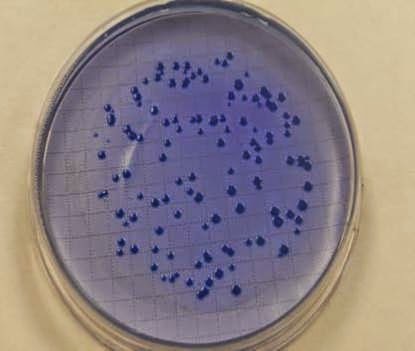 Total Coliform are fine at 35 degrees Celsius, while E. coli – a part of the Coliform Group are thermotolerant and like it hot – at 44.5. degrees C.
When incubating bacteria, because it’s your job to grow them, be sure that the incubator is at the correct temperature not only during the thermometer check times, but use a continuously monitoring device, (plugs into your laptop), so you know for sure that the incubator held temperature during the whole incubation period. Use a thermometer that has been calibrated against a NIST traceable thermometer. When laying your membrane filter on the prepared media plated or other media source, place one portion of the filter at an angle onto the media surface – then while applying a very slightly downward pressure simply roll the rest of the filter onto the media surface using your sterile forceps or clips. TIP: Do at least 5 serial dilutions, more if you have the sample material. Be sure to incubate your cultures upside down – media side up, to keep the moisture level of the media up. Following these simple rules will go a very long way in assuring you get great results with your DMRQA test in membrane filtration! Good Luck!